Special discounts for multiple orders. Be sure and include the name (s) to be included on each certificate(s). Please allow three weeks for delivery. Thanks for your business. On this land, about 150+ years before the Nation was founded in 1776 – mountain moonshiners made and enjoyed their sweet Mountain Elixir. These hearty folk ran their stills deep in the mountains under the shine of the moon. Moonshiners have been a part of American history ever since. 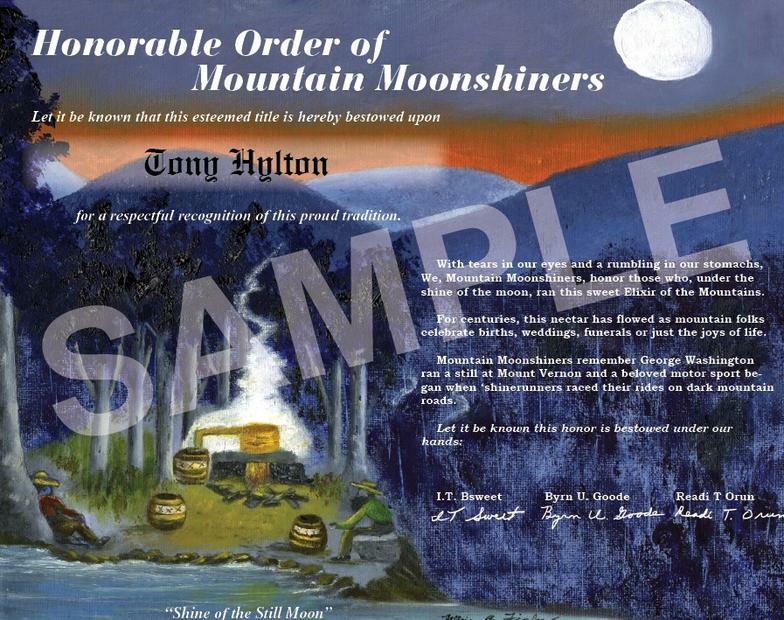 Now, the Honorable Order of Mountain Moonshiners lets you connect with this throat-burning, stomach-rumbling tradition. The Order has commissioned an original oil painting – Shine of the Still Moon - recognizing this legendary part of American culture. Marian Fisher’s original oil painting - Shine of the Still Moon - depicts moonshiners running their Sweet Mountain Elixir deep in lush mountains – under the shine of the still moon. Marian has exhibited in Appalachian galleries and her paintings adorn homes from West Virginia to New York. Marian feels she got her talent from her grandmother, and has now introduced her granddaughter, Allison, to oils to continue the family tradition.